Every layer blend mode we've seen so far in our look at the essential blend modes for photo editing in Photoshop has been about darkening images, lightening images, or both. The Multiply blend mode ignores white areas and makes everything else darker. The Screen blend mode ignores black areas and makes everything else lighter, while the Overlay blend mode ignores areas that are 50% gray and makes dark areas darker and light areas lighter, improving image contrast. Our fourth essential blend mode in Photoshop has nothing to do with shadows, highlights or image contrast and everything to do with color. In fact, by no sheer coincidence, it's named the Color blend mode, and if you recall from the first page, it's found in the Composite group of blend modes along with the Hue, Saturation and Luminosity modes. The Color blend mode is actually a combination of the first two modes in the Composite group, Hue and Saturation. When you change a layer's blend mode to Color, only the color (that is, all of the hues and their saturation values) from the layer is blended in with the layer or layers below it. The luminosity (lightness) values of the layer are completely ignored. The Color blend mode is perfect for when you want to add or change the colors in an image without changing the brightness values. As we'll see on the next page, Color is actually the exact opposite of our fifth and final essential blend mode, Luminosity, which ignores all color in the layer and blends only the lightness values. One of the most popular uses for the Color blend mode is to colorize black and white images. This allows you to add color to the image without affecting the lightness values. Simply add a new blank layer above your image and set the blend mode of the layer to Color. Select your Brush Tool from the Tools palette, choose the color you want to paint with, and begin painting on the layer to add your color. 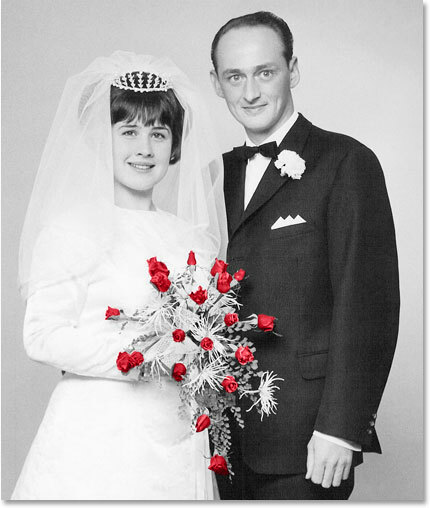 An old black and white photo of a wedding couple. The Layers palette showing the new blank layer, "Roses", above the Background layer. Changing the blend mode of the "Roses" layer to Color. Painting with red inside the roses. The roses have now been colorized red. Lowering the opacity of the "Roses" layer. 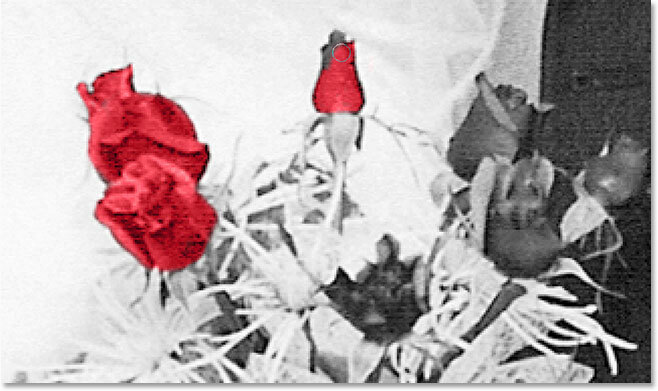 The image after lowering the opacity of the "Roses" layer. If we wanted to, we could continue colorizing the rest of the image, but I like the effect of having just the roses in color. Of course, this is just one example of how useful the Color blend mode is, and it's certainly not limited to restoring old photos. The Color mode is just as handy for changing colors in your new digital photos. To change someone's eye color, for example, simply select the person's eyes, add a Hue/Saturation adjustment layer, drag the Hue slider left or right to select the color you want, and then change the blend mode of the Hue/Saturation layer to Color. We've now looked at four of the five essential blend modes for photo editing in Photoshop. Up next is our fifth and final blend mode, the Luminosity blend mode, which is the exact opposite of the Color mode! Or jump back to the main page to choose a different blend mode!